Recently I was in Brisbane and popped into the Queensland Art Gallery to visit their Fairweather collection. I was bemused to see on the wall a note to say that Fairweather was not a religious painter. This echoed a comment I had heard about another of my favourite painters Arthur Boyd. Pride of place that day in the Queensland Art Gallery was one of Fairweather’s most famous works, Gethsemane. Also on display were his works Epiphany and Palm Sunday. Fairweather is also well known for his series on the Drunken Buddha. 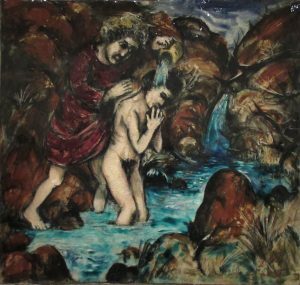 As it happens, on display that day was also Arthur Boyd’s painting, Baptism. Anyone familiar with Boyd’s work knows that it is filled with religious themes and iconography. Perhaps the most striking is the breath-taking series of huge tapestries that he designed on the life of St Francis of Assisi. So how is it that these two eminent Australian painters can be described so often as non-religious? I suspect there are several interlocking reasons. One is the deep-rooted suspicion many educated Australians have for religion. Religion in their minds is associated with the narrow minded, the dull witted, the bigoted, the uncreative. 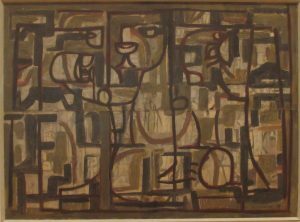 How could great Australian artists be religious? They couldn’t possibly be religious, despite the iconography of their paintings. In Australia, religion has most often been associated with either the established (and therefore elite) church of the Anglicans, the clannish and controlling church of the Roman Catholics, or the puritanical and rule bound Presbyterians or Methodists (no drinking, no smoking, no dancing). Most recently the public persona of religion has been taken over by the extreme right of the Australian Christian Lobby and certain Bishops of the Anglican and Catholic communions. In this public understanding of religion, religion is perceived as religious denominations who claim an exclusive understanding of what Caputo would call the “uncontainable”. Of course, this dead husk of a persona, is not what religion is really about. Within the Anglican, Catholic and Uniting churches there are flickering flames of love that glimpse the uncontainable and respond with a commitment to justice and compassion for humans and all of creation. And this religious flame ignites elsewhere; in Aboriginal and Torres Strait Islander religions, in Islam, in Buddhism, in Hinduism, in Judaism, with the Quakers, and even at Hillsong. Much art also points to this flame, sometimes with religious or spiritual iconography and sometimes without. We know such art because it doesn’t just entertain or distract but takes us beyond ourselves. We glimpse something “other” which is real but inexpressible. This flame exists in nature but is not contained by it. The Australian novelist Kylie Tennant has described well both its ordinariness and its ineffability. Maybe the challenge for progressive Christians today is not to try and contain the inexpressible in new creeds or dogmas or forms, but to find common ground with all who sense the inexpressible wonder and beauty of life, and who want to follow it, commit to it and share it in a spirit of gratitude, of justice and compassion. Maybe then, the art experts will come to realise just how “religious” are two of my favourite artists, Ian Fairweather and Arthur Boyd.